Dowlas UK Limited has instructed works to commence at Weston Gateway Business Park for a brand new state-of-the-art headquarters office for Knightstone Housing Association. This prestigious site will house over 250 staff. Comprising 40,000 square feet of net office space, the new office will be built over three floors with Knightstone occupying two floors by Spring 2013. 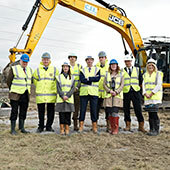 As well as the new office space the building will also include training facilities, meeting rooms and informal spaces. The design will maximise natural light to create a pleasant and healthy working environment. 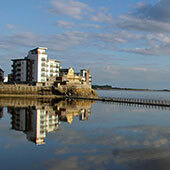 The Knightstone building will go beyond the minimum building standards and will achieve a BREEAM rating of very good. To save on energy costs, PV solar energy panels will be placed on the south facing side of the roof. Orientated on an east west axis, south facing windows will be shaded from the summer sun by Brise Soleil aluminium louvers. 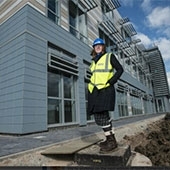 Work Avon and Somerset Police identified Weston Gateway Business Park to be the best logistically connected location in North Somerset to build their new facilities. A 20,000 sq ft building that will house 140 officers across 24 hour shift patterns. All planning permissions were procured with the assistance of Dowlas. Construction work commences in May 2016. Work commenced on the new pub/restaurant in June 2013 and opened in March 2014. The pub features a large car park including a coach parking bay to enable coach trips to stop off and get topped up with food and beverages. This is the first Greene King, Hungry Horse pub to feature a coach parking bay. The addition of the pub/restaurant is a real added bonus to any businesses looking to relocate to Weston Gateway Business Park providing staff with a welcome break away location within easy reach for lunch breaks, meetings and entertaining. 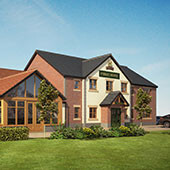 The pub was a turn key design and build package provided by Dowlas.